Teenagers from Houghton Regis and Dunstable are among the latest caught up in a Beds police crackdown on burglaries. A 16-year-old boy from Dunstable and a 15-year-old boy from Houghton Regis have been charged with 10 counts of conspiracy to burgle and have both been remanded in custody. The countywide crackdown on burglary - known as Operation Fidelity - has seen yet more positive results from investigations in recent weeks. Detective Chief Inspector Juliette Everett said: “We’re celebrating a long list of detections as a result of excellent cross-force work by our burglary cohort team, integrated offender management team and intelligence department, all of whom contribute to the forcewide Op Fidelity initiative. “Our innovative approach to tackling burglary has seen the force improve its national ranking by seven places, and has resulted in the greatest reduction in burglaries of all forces. The recent successes include securing four burglary charges against James Barlow, 49, of no fixed address, in connection with offences in Bedford. He has been remanded into custody pending a further court date. Natalie Walsh, 26, of no fixed address, was also charged with burglary following a break-in at Conduit Road, Bedford along with four counts of theft from a shop and has also been remanded into custody. 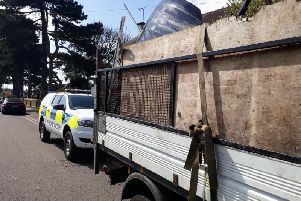 The team has also secured related charges in connection with the handling of stolen goods, while five juveniles have received charges relating to a recent burglary series in Leighton Buzzard. A 15-year old boy from Houghton Regis was charged with one count of burglary, a 16-year-old girl from Nottingham was charged with two counts of burglary and a 16-year-old boy from Bedford was charged with one count of burglary along with additional charges. In addition, Lowen Sweeney, 24, formerly of Wadsworth Court, Bedford, was sentenced on 20 May to five years in prison for two burglaries and additional offences taken into consideration by the court. On Wednesday, Stephen McCay, 23, of Winifred Road, Bedford, was also charged in relation to a burglary in Queen’s Drive which occurred only on Monday (13 June). Since the launch of Operation Fidelity last October, the force has seen a four per cent reduction in burglaries across the whole of Bedfordshire.